* This enrollment will not cost you any additional cost. If you do not want to sell on Amazon with the Amazon Business tools and features, you can click here to unenroll. In order to use ‘Quantity Discounts’ and ‘Business Prices’ feature, it is necessary to set up on your side. Since Amazon Business columns will be automatically added in some types of Inventory Reports, ensure that you are generating the correct report while using third-party connections or systems. Quantity Discounts feature enables you to offer tiered discounts to Amazon Business customers who are in need of higher-volume purchases. 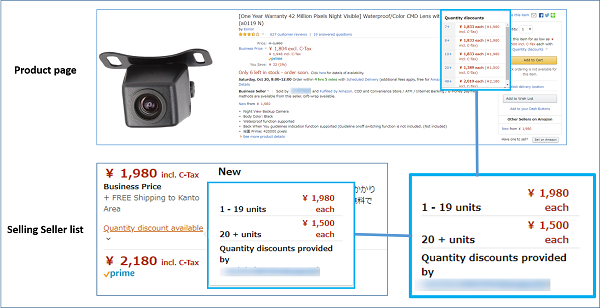 Since Amazon Business customers can directly submit a quantity discount request to sellers, offering quantity discount to customers allows to win high-volume sales and earn repeat business. *Unhide the ‘Business Price’ feature on the ‘Manage Inventory’ page before setting up Quantity Discounts. To know more about how to set up quantity discounts, click here. Business Prices feature enables to offer special price for Amazon Business customers as well as standard price. In addition, you can make a business-only offer such as industrial items exclusively for Amazon Business customers. B2B Central allows you to see B2B sales by Amazon Business customers and top selling items. B2B Central is located on ‘B2B’ tab on Seller Central. * This email address is for sending only. Please do not reply to this email. * While the URLs displayed in this e-mail may differ from the URLs shown in the address bar of the landing pages (because the URLs displayed in this e-mail are automatically generated by the system), the URLs are linked to content provided by Amazon. Issued by: Amazon Japan G.K.
© 2018 Amazon.com, Inc. or its affiliates. All rights reserved. Unauthorized use or copying is prohibited. Amazon, Amazon.co.jp, アマゾン, Amazon Services, Amazon出品サービス and other names and logos of Amazon’s services are trademarks of Amazon.com, Inc. or its affiliates.